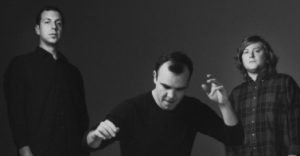 Future Islands are an indie electro-pop trio that formed in Greenville, North Carolina in 2006. They met while attending art school at East Carolina University back in 2003, and started out playing in the band Art Lord and The Self-Portraits. When they disbanded the three formed Future Islands, and are now based in Baltimore, Maryland. The band is fronted by Samuel T. Herring (vocals), William Cashion (Guitars), and Gerrit Welmers (keyboards). Mr. Herring created quite a buzz after his epic dance performance on the David Letterman show three weeks ago. When the band finished playing “Seasons (Waiting on You),” a stunned Mr. Letterman screamed, “Buddy, come on! How about that? I’ll take all of that you got.” The verve and manic dance moves of frontman Samuel Herring shocked the late-night host. Off camera, Paul Shaffer signed off on Letterman’s adoration with “Fantastic! Love this band” (watch the performance below). The next night Dave was so impressed with what he saw the night before, he referenced the moves in his monologue with “Let’s Dance” and showed Mr. Herring one more time. This week the band released their fourth studio album “Singles.” Their three prior albums include: Wave Like Home (2008), In Evening Air (2010), and On The Water (2011). This will be one of those early afternoon can’t miss performances. This will be a performances you talk about in the car on your way back to the hotel, and Monday morning during your Reflection Day breakfast. I repeat, DO NOT MISS THIS SHOW!